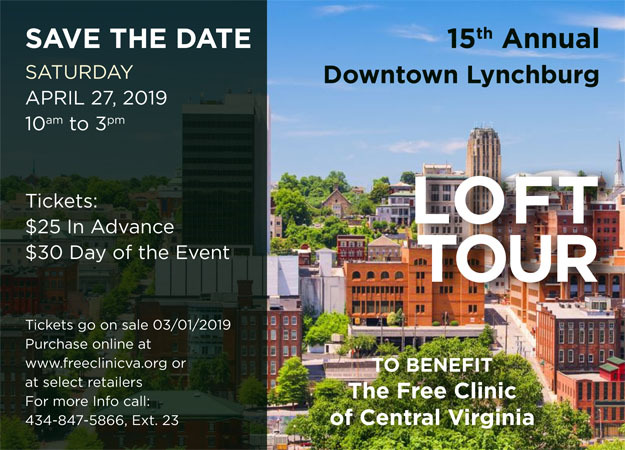 Will-call tickets and a tour map/brochure available for pick up at the Free Clinic, 1016 Main Street, Lynchburg, starting at 9 a.m. on Saturday, April 27. The tour starts at 10 and is self-guided. Tour-goers can choose to visit any or all of the lofts on the tour in any order they wish. Volunteers will be on hand at each site to direct you. Help the Free Clinic with credit card processing costs. Add $1.00 per ticket to your order.